Although the digging tools - spades, forks, mattocks, - are simple garden tools, there's good and bad technique in using them. And the difference can be:- easy, relaxed, job done gardening, o r - strain, back ache and very little work done. Before you start gardening, particularly when doing heavy tasks, do a gentle warm up first. You might think this is silly, but to go straight from rest to work, especially on a cold day, risks strain and cramp. Your muscles need a short warm up before they work properly. So give your legs and arms a gentle shake around and do a few simple bending and stretching exercises. You should mobilise any stiff joints and increase circulation before your digging tools start work properly. Of course the ground conditions need to be satisfactory before you can really embark on digging. Wet soil is much much heavier than dry, and it's sticky too. When wet soil softens to a paste it is damaged if worked on. Dry soil can set hard like concrete. Although it may be softer under the surface, getting started will require a different technique. If you have to work in such conditions I suggest using an the azada or mattock digging tools described below. Although garden spades are the simplest of digging tools I've seen people make very hard work of it. They put themselves at real risk of strain and injury because they use the wrong technique. Get to know how to handle a spade. Don't pull on your back. 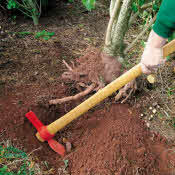 To dig with a garden spade stand upright with one foot on the spade and your weight over the spade. Use your foot and hands to transmit your full body weight downward. Grasping the handle with both hands you will be able to steady yourself. And if the ground is hard you will be able to push the spade from side to side to prise the corners into the ground. See my link to garden spades. Once in the ground to spade depth, take your foot from the spade and place it back a step. You will now be standing astride like a fencer. Use your weight to force the spade handle back and down. You should only lift it when the spit of soil is free from the earth around it. And it can be lifted free by leverage alone. To lift the soil up or turn it - keep your back straight, legs astride, and bend your knees so as to reach down. You will be pushing the handle end down. But with the other hand grasp the shaft as low down as possible. Power the lift from your legs and arms. Balance the weight so that one straight arm keeps the handle end down while your other arm flexes to assist the lift. Don't lift the soil higher than necessary. To turn a spit of soil twist the handle over as soon as it comes free. If you are loading a barrow ensure it is conveniently positioned so the soil can be directly turned into it. Double digging is when the bottom of the first spit is loosened either by a garden fork or spade. Another excellent tool for this job is the Garden Claw. It has a long shaft with handle bars to twist cultivating teeth into the earth. For double digging you'll avoid bending, but use your weight to drive the teeth into the bottom of the first trench. Digging down to free deep roots or make a pond is hard and cumbersome work. My advice is to dig enough soil to one spit deep first so that you can stand inside the trench to make it deeper. the wheel easy is an excellent replacement for a wheel barrow as it lies conveniently low on the ground and doesn't require a big lift to load it. Bulldog 7101 Evergreen Digging Spade - solid forged carbon steel, powder coated, with strong ash shaft & warm easy to grip D handle - all made at Clarington Forge U.K. - I use this one & it's the best. Check this range of specialised garden spades including designs for taller gardeners, for ladies, as well as designs to make particular jobs from transplanting, post holes, potato picking... easier. An excellent range of children's garden tools are on this link. English Garden Spades for American gardeners. These are without doubt superior tools, honed by the exacting quality demands of 1940 to 1955 English Gardeners. To find American Shovels click here they are better suited for digging stony ground. Perhaps garden spades and forks don't suite your style. If so you're not alone - see below. These digging tools use their own weight to make a downward strike into the earth. Pay attention to where the tool strikes and the angle of strike. The swinging and striking action is easy but needs careful control - it is capable of smashing a hole in your leg if it gets in the way. sourced in U.K. & America. The main effort involves lifting the head up before the strike. This is followed by levering up and pulling on the handle to draw out the soil. A long handle saves bending and working your back. These digging tools have different modifications to suite a range of tasks - from burying weeds, trenching and double digging, to clearing, planting and cultivating. Pronged mattocks with a long reach are my favourite. Use them to clear new ground, lifting tough perennial weeds as well as digging and double digging. Pointed mattocks have a broad wedge shape head used to draw out a trench for planting potatoes, laying new hedges, earthing up ridges, or similar. This tool works quicker than a spade. Pick mattocks have an axe like head opposite the mattock. You can use them to cut through tree roots and define straight sided trenches. It's also useful for laying and lifting flags and pavings. Short handled mattocks are used for more close-up work. You can easily change direction and work around other plants. See a range of digging hoes at Ferndale Lodge U.K.
59" handle (150cm) Long Handle Pronged Mattock a strong tool great for cultivating any soil. some tool heads need knocking onto handles. Get the Duck Foot Digger ideal for trenches and ridging up. Otherwise you may need enough digging tools for the family or your gardening community to work. - Or find a garden helper below (U.K.) below. Check out my Garden Tool Shed for information on motorised digging tools, types of spades, forks, cultivatores, and other useful gardening resources for the potting shed and garden.